When I started homeschooling a dozen plus years ago, I attended a small homeschool event. Very small. That included some of the biggest names out there at the time. A month later, I was able to spend one day at our state convention. That event exposed me to the "big guys" but also to a number of smaller homeschooling companies. One company that I heard about repeatedly was Alpha Omega Publications. I'll confess that I didn't look too closely at their materials at the time. I don't think they had anything for 3 year olds back then. But they are someone "everyone" seems to know. Having the opportunity to review one of their courses was a huge blessing. There is so much to choose from -- Horizons has workbooks for PreK-12th grades, LIFEPAC covers core subjects and many electives from 1st-12th grades with little workbooks, Monarch is their online program with materials from grades 3-12, and Switched-On Schoolhouse is the computer software version of their program for grades 3-12. We chose a Switched-On Schoolhouse title, World Geography, which sells for $99.95. I have both my 9th and 11th graders using it, and this has been a really nice fit. World Geography is one of their core subjects -- this being their 9th grade History & Geography title. If you continue with the Switched-On Schoolhouse sequence, you'd then take World History (10th grade), American History (11th grade), and Government and Economics (12th grade). Or there are a number of history-related electives, such as The Civil War or Twentieth Century American History, if you'd like to customize it a bit. What you get is a box with installation instructions and three disks. Two are for installing the Switched-On Schoolhouse program itself, and one is for the World Geography course. This does not work on Macs, which is frustrating for me, but we do have a couple PC machines around. Installation was very straight-forward (once I upgraded Windows! ), even for someone like me who never uses a Windows-based machine. It took some time to get set up and going, but the process was painless. 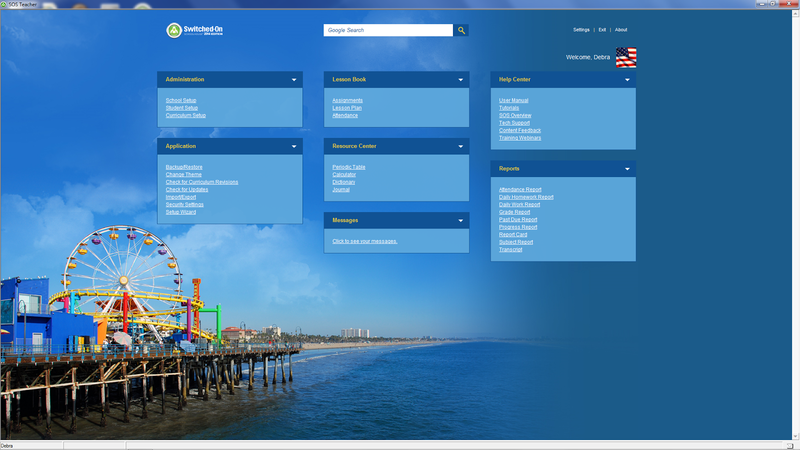 Once the program and course was installed, I could go into the teacher software and get my teens assigned to the course. That was also fairly easy, though not quite intuitive. I clicked on days we wouldn't do school, and had it all scheduled with the push of a button. Then the teens could sign in and start. This is my favorite thing ever about doing this. Everything is all set up. The kids get into the program and right there it tells them what to do. No planning on my part. They can get in, do what is assigned today, and get out. Below, you see that someone <ahem> is a bit behind. But when he opens up the program, he knows that he needs to actually finish his project (more on that below), finish up the Settlement and Movement lesson, and then do today's assignment, the quiz. Ideally, he'd be caught up on things, but life was a bit crazy at the end of last week, and he was busy showing me around the student side of this program on Thursday, so he did not actually get his project input (he has completed it) and with volunteering at the food pantry, he ran out of time to do his lesson on Friday. The program grades most of the material, however with anything more subjective, I get the chance to go in and grade those myself. What is wonderful is that they do give the actual question, the child's answer, and some text to explain to me what they expect in an answer. Very straight-forward for me to grade. I have the ability to reassign a question to the student, which I have done, or to grade it. There are also projects. The first project (the one above that is past due!) involves summarizing a news article from a geography point-of-view. I love that this isn't all computer-time work, and the kids do actually have to dig in elsewhere and do some independent off-the-computer work. 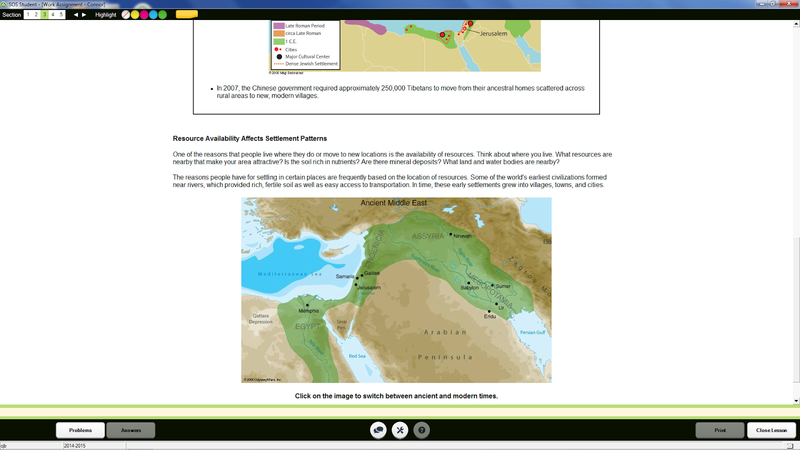 Some of the daily lessons include off-the-computer work too, such as pulling out a local map, plotting a trip, and noting geographical features that would be part of that; or an assignment that involved some research and summary graphs off the computer. 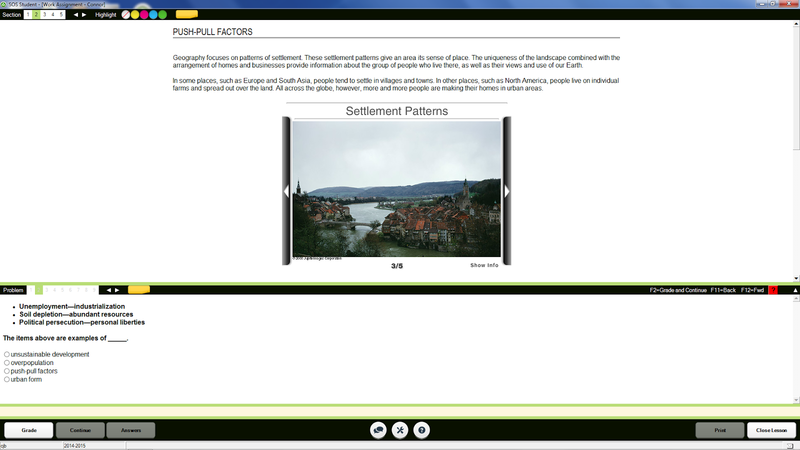 The course covers basic geography. The first two units are introductory in nature. There are then eight units covering basic geographic regions, which may be a continent or a part of a continent. For instance, there is a unit on North America, a unit on Western Europe, and a unit on Eastern Europe and Russia. There are also two semester review units in there, including exams. 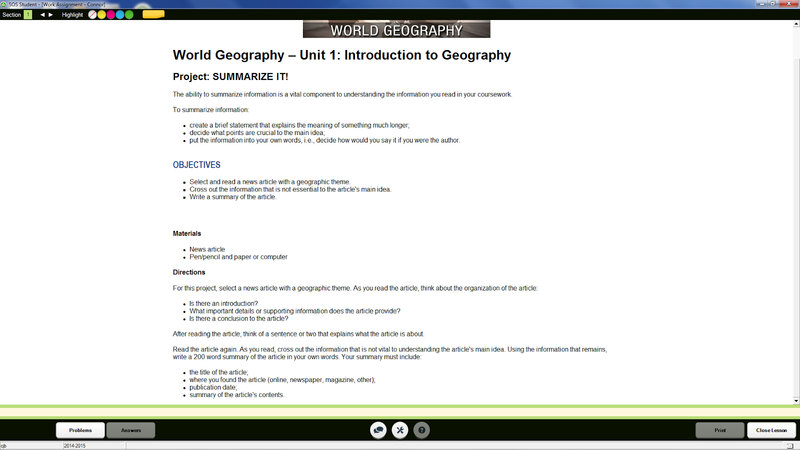 I think this is a solid program for a credit in World Geography. I love that the kids can be almost completely independent, and both can be working in the same course but they do not have to wait on each other at all. Connor (11th grade) can get up and just get his work done. William (9th grade) can dawdle and get to it much later. And Connor isn't held up because William is sleeping in. Yet they can still discuss it, as they are more or less doing the same work (William is moving a bit slower through the material). One thing I've found, especially for high school, is that I really do need some things where they can just do it and I don't have to be terribly involved. For my family, World Geography is a perfect choice for that kind of open-and-go work. The kids opinions? Well, neither of them love this, but they don't hate it either. They like knowing exactly what is expected of them to be done for the day. They like that they pretty much know where they stand as far as grades go, as they aren't stuck waiting on me forever. When mom does get around to grading the manually-graded stuff, their scores usually rise a little bit. Neither of them particularly wants to go all-out and use Switched-On Schoolhouse for everything. But they both think this is a great way to do a course or two at a time, and they have both been eying some of the electives especially. Other members of the team reviewed various other products, including Monarch, Life-Pac, and Horizons. We are blessed to bring you an amazing giveaway from Alpha Omega Publications Homeschool Division. The winner will receive one subject from each of the main product lines plus a $50 Amazon gift card. That could be a retail value of $450! To enter, please use the form below. 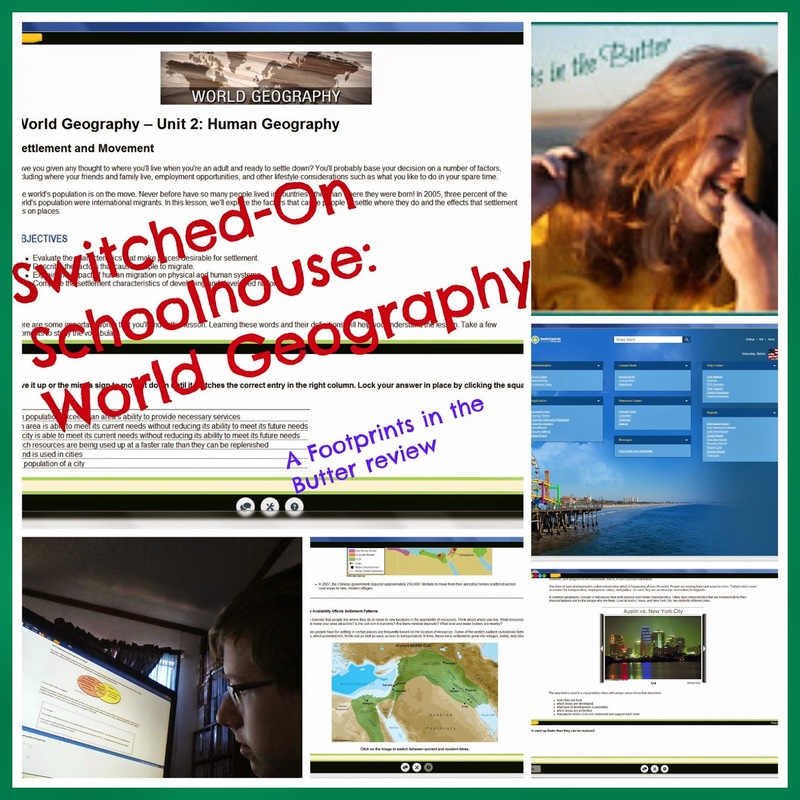 Disclaimer: I received the Switched-on Schoolhouse World Geography course free of charge in exchange for my review. I was not required to write a positive review. All opinions expressed here are my own. I received no other compensation for this review.